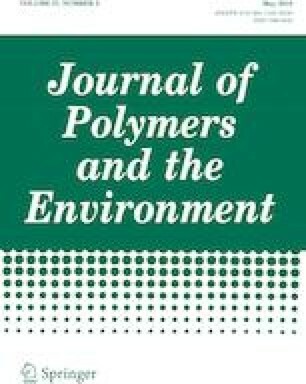 Recycled rubber from waste of natural rubber gloves was prepared via thermo-mechanical de-vulcanization using diphenyl disulfide as a de-vulcanizing aid. After de-vulcanization, the recycled rubber has a higher soluble fraction and a lower cross-link density than that of untreated rubber waste. The de-vulcanization efficiency was then analyzed by Horikx’s method and it was found that random scission or non-selective breakdown of the rubber network, due to both main chain and cross-link scission had occurred during de-vulcanization. Thermoplastic vulcanizates based on recycled rubber and polypropylene blends were prepared using the dynamic vulcanization technique in an internal mixer. Maleic anhydride was used as a chemical modifier in the thermoplastic vulcanizates. The effect of the maleic anhydride loading level was also studied. It was found that the mechanical and rheological properties of the thermoplastic vulcanizates improved with an increasing maleic anhydride content. Furthermore, it was confirmed by SEM morphological investigation that an increasing maleic anhydride content caused a decrease in the size of the spherical dispersed vulcanized rubber domains in the continuous polypropylene matrix. A maleic anhydride content of 80 meq was found to be the optimum content for the improvement of the phase compatibility of the thermoplastic vulcanizates. The authors would like to thank the PSU research fund, Grant No SAT590172D and the Faculty of Science and Technology, Prince of Songkla University, Pattani campus for their financial support.